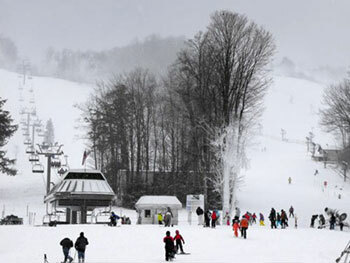 Boyne Mountain is the granddaddy of ski resorts. Skiers have been coming north to Boyne Mountain for nearly 60 years. And with good reason. There is so much to do at Boyne Mountain in Northern Michigan! Here you'll find skiing and boarding on 415 skiable acres, an Austrian-American Ski ski school, ski rentals, ski village with shops and dining, terrain parks, tubing, Zipline Adventures, and cross country skiing. Boyne Mountain has it all when it comes to the perfect Northern Michigan winter getaway. Go for a dog sled ride or enjoy romance at its best with a horse drawn wagon ride. Try ice skating, tubing or snowshoeing for the first time or as a seasoned expert. At the end of the day, stop for a cup of hot chocolate at one of the mountain restaurants and then ski down to one of three lodges for ski in/out lodging. With a ski season that runs from Thanksgiving to Easter, you'll have the chance to come north again and again to ski and board at Boyne Mountain.